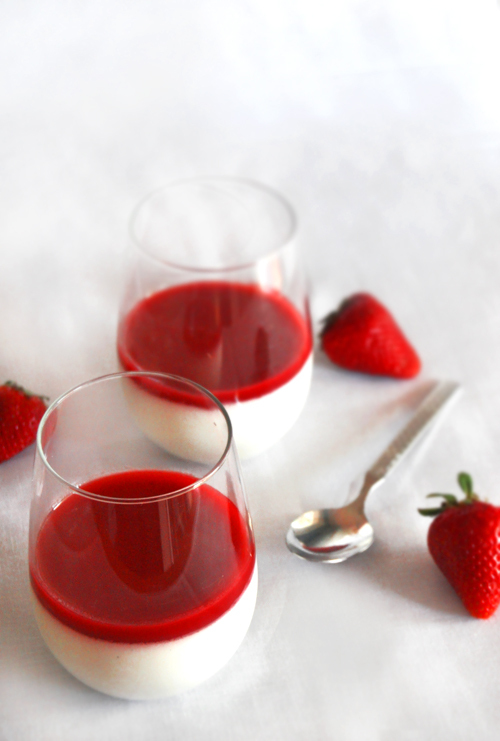 Panna Cotta is a dessert I used to have, from time to time, while I still lived in Croatia. I like it very much, but it's not like it's my favorite dessert. After eight years though, after seeing a friend have it at a restaurant, I really wanted some, and to make it myself too. I am nervous about gelatine but face your fears right? And the first try didn't really work out. The recipe I found online had way too much gelatine in it. Panna cotta tasted wonderful, but it was so thick it was not pleasant to eat at all. So, second batch I lowered the gelatine drastically, from 2 tablespoons, to 2 teaspoons, and it turned out great! Heat heavy cream and milk in a pan until hot, then remove from heat. Cut vanilla bean lengthwise and scrape the seeds out with the back of the knife. Put the seeds and vanilla bean in the cream and milk mixture. Mix gelatine with lukewarm water and then heat in a bowl that you will put over a smaller pan with a little water in it. Remove the vanilla bean from the cream and milk mixture and mix in the gelatine. Pour evenly into prepared dishes, cover and refrigerate for about 6 hours or until set. Boil sugar and water and add the strawberries. When they are soft, blend all with a hand held mixer. 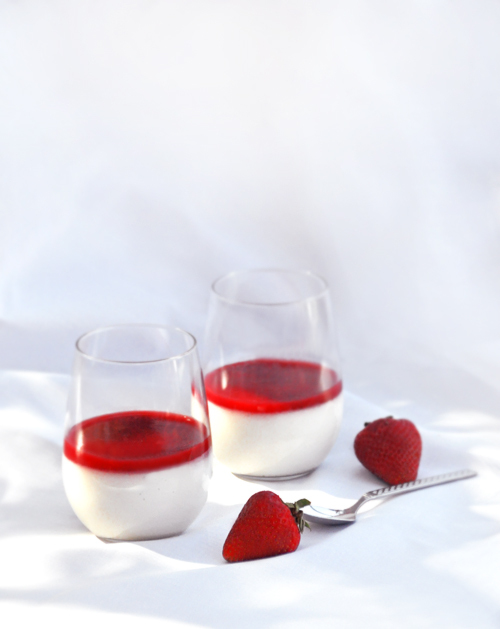 Let it cool completely and when panna cotta is hardened enough, pour little bit over the top. it really depends in what you serve them and how much you put in the dish, I made 6 of these!